Hey Joe, where you goin’ now with that gun in your hand?! Updated for modernity! Featuring the ricin letter! Like, like, like, like, like. Blobs of castor powder containing ricin and some oil stains on Bloomberg letter. UPDATED: FBI detains man in Texas. See post footer. [The ricin mailers] also must have at least vague recognition that the FBI’s WMD unit is now well-prepared to track such cases and there is a good chance they will be arrested. When ricin mail arrives and a determination is made that active poison is present, one can imagine the FBI and other federal agencies immediately using Internet search, as well as their own tools, to scour the web for language similar to the messaging in the ricin mail. This can be one Achilles’ Heel of the ricin mailer. Another vulnerability is the existence of confidants. It is one thing to listen to a loony acquaintance rail about the president, or Mayor Bloomberg, and how they will make a poison powder. It is quite another to read in the newspaper that such a thing has been done, that castor beans have been pounded, the words are nationwide, and you might have an idea who did it. “Authorities, including the FBI, questioned a New Boston, Texas, man Thursday night in connection with an investigation of ricin-laced letters sent to government officials, including President Barack Obama,” KSLA-TV in Shreveport, La., reports. Possible hit or blind alley? Time will tell. But bean pounding, the making of poison powder in this country in 2013, hardly ever occurs in a perfect vacuum. Texarkana Gazette breaking story on man in connection with new ricin letters. “FBI agents secure the home [of Nathan D. Richardson] at 111 Maple in New Boston, Texas, where ricin is believed to be found,” it reads. Blobs of castor powder containing ricin and some oil stains. The grinding or pounding of castor seeds into castor powder containing ricin has its roots in the violent far right in the US. As far back as the late Eighties, American men in this demographic were interested in it, publishing recipes for the process in their pamphlets and books. The books and writings were devoted to collecting knowledge on how to use and make improvised weapons in an insurrection against the US government, or for use in a race war. Many of the recipes for ricin now found on the Internet descend from the writings of Kurt Saxon, first in a pamphlet called The Weaponeer, and later in The Poor Man’s James Bond. The newest case of ricin mail with its letters threatening the President, Mayor Bloomberg and to his Washington-based gun control group, implicates a philosophy not uncommon in the country’s violent far right. “Also, in the event that our nation is invaded by Foreign Devils, it is up to you to destroy them with speed and vigor. Or — and perish the thought — if our Capitol should fall to the enemy within, I expect you to do your duty. This bleak philosophy, or attitude — if you will, has long been associated with America’s violent right. WhiteManistan may not like what the extremists are doing, or the implications of the threats in the latest ricin letter, but that’s where the roots of it are. Formally, at GlobalSecurity.Org. Twitter tweet and share, please. More letters associated with the Matthew Buquet ricin case in Spokane have been reported. The FBI today said that a total of five threatening letters, three of which tested positive for the poison ricin, were mailed from Spokane earlier this month. Four of the letters, including one to President Obama and another to Fairchild Air Force Base, have been intercepted, the FBI said. One letter was apparently also mailed to the CIA and has gone missing. If this hold, then all three of the recent ricin mailings have involved letters sent to the president. Rhetorical question: Why does anyone thing personal mail with powders in it would ever get to the President over ten years post anthrax? Three incidents with ricin-tainted mail between April and May constitute new and uncharted territory in the US. And in two of the instances ricin mail targeting the President has been intercepted. The first, from alleged castor bean pounder J. Everett Dutschke in Tupelo, Mississippi. And now from Shreveport, LA. This is a remarkable series of events, one that should shock Americans. Because while no one has been killed or even seriously made ill in any of the attacks, ricin mailing is insane behavior. And real ricin mailings (as opposed to powder hoaxes), which seem to immediately inspire copycat mail, has never happened. Perhaps years down the road, there is Ph.D. thesis in the psychology of domestic poison powder mailers in it. Who thought unrelated people could be so psychotic, using the same poison powder ploy? You will have to kill me and my family before you get my guns … Anyone [who] wants to come to my house will get shot in the face. The right to bear arms is my constitutional, God-given right and I will exercise that right till the day I die. What’s in this letter is nothing compared to what I’ve got planned for you. To date no domestic terrorist has ever produced pure ricin. 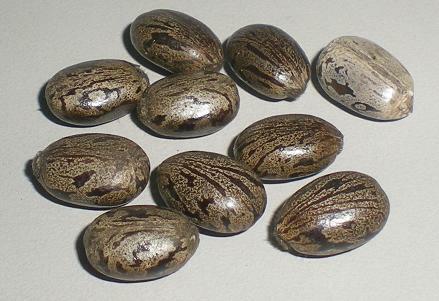 What is produced is the crude powder of castor seeds which contain some ricin. No one has ever been killed in a domestic US ricin incident. However, now we’re in new territory, at least for the short term. anthraxer, Bruce Ivins, saw to that. They also likely have at least vague recognition that the FBI’s WMD unit is now well-prepared to track such cases and that there is a good chance they will be arrested. language similar to the messaging in the ricin mail. It is one thing to listen to a loony acquaintance rail about the president, or Mayor Bloomberg, and making a poison powder. It is quite another to read in the newspaper that such a thing has been done, the words are nationwide, and you might have an idea who did it. Considering all these things, the three back-to-back ricin incidents indicate a threshold has been crossed. These are people who perceive that they may certainly be caught. But they do it, anyway. In this case, the individual certainly appears to want everyone to know his words. It is quite an unusual standard. This marks a strange and grotesque period as the country enters the summer of 2013. Crazy people engaged in a small and unconnected, but still quite astonishing, national group ricin mailing. It’s a first in attempted American bioterrorism. We’re number 1, the exceptional country. Wire reports inform that three police offices experienced mild diarrhea after contact with the latest ricin mail. Consistent with a minor degree ricin (or castor oil, since the mail was said to contain a greasy powder) ingestion? Possibly. Or something else, unconnected. Later laboratory testing may shed light on in coming days. Analytically, what a castor powder mixture containing ricin looks like after SDS gel electrophoresis. Examples from a ricin domestic terrorism case in the US begin in the lanes to the right of the clear lane. The single band lane to the left is a lab ricin standard. And the arrow denotes ricin component in the crude mixture from castor seeds. Three ricin-letter cases in the space of April to May make a remarkable national landmark. This has never occurred before. What we’re seeing right now is novel deeply psychotic, imitative behavior, by Americans very much influenced by the group received terrorism mythology of ricin poison. And it has been all uniquely domestic, none of the cases seeming to have much to do with 9/11. I’ll remind readers, particularly with regards to this case, the popularization in use of ricin arose from the neo-Nazi violent right, specifically the writings of Kurt Saxon in The Poor Man’s James Bond. A spokesman for the Federal Bureau of Investigation, J. Peter Donald, confirmed that the bureau was investigating the letters, but declined to comment further. Both letters were identical in content, bore references to the debate over gun regulation and contained written threats to Mayor Bloomberg, Mr. Browne said. The letters contained a “pink, orange oily substance,” Mr. Browne said, which tested positive for ricin on Wednesday at the National Bioforensic Analysis Center in Maryland. The mild symptoms may not mean anything since others were not affected. Castor would have to be eaten or swallowed to result in diarrhea. Perhaps more likely, something else or shared stress due to the circumstances of a ricin-letter attack. Doubtless the FBI’s ricin group, now experienced, is well on the case. Analytically, what a castor powder mixture containing ricin looks like. Example from a ricin and domestic terrorism case in the US. Arrow denotes ricin component in crude mixture from castor seed. The US is terribly positioned to talk of fair play in cyberspace. However, it pretends otherwise in the current campaign to boost cyberdefense-spending in the national security megaplex. Consider that one whole plank in the US discussion of China’s cyber-espionage is that the latter is not playing fair. 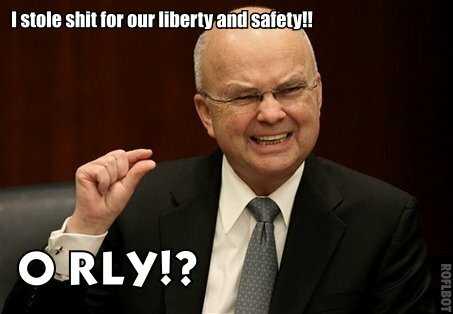 American officials have lined up to assert this over and over, which led to this recent lampoon made for DD blog, one showing Michael Hayden, General Keith Alexander’s predecessor at the National Security Agency. Hayden famously maintained stealing another country’s secrets for this country was for the security of American citizens, the preservation of liberty. The Chinese, on the other hand, were engaged in dirty pool, when they were stealing (or trying to steal) similar things. I saw a video of when this was delivered to a small miscellaneous audience of inside-the-Beltway journalists and national security shoe-shine boys. No one blinked or asked a question. “China is doing stuff you’re not supposed to do,” says Jacob Olcott, a principal at Good Harbor Security Risk Management, a Washington firm that advises hacked companies. This is Richard Clarke’s firm talking. Clarke has mined the catastrophism end of the cybersecurity discussion since the Clinton administration. That’s a long time, from public service to the private sector and through non-fiction books and novels. As a celebrity in the arena, Clarke has taken it to the bank. Anyone speaking from Good Harbor is a sock puppet in the cause. The Businessweek piece notes that the National Security Agency has been into everyone’s networks, accumulating so much experience and technical power that much of the routine penetration and collection is automated. The Chinese are not moved by American complaints. And yesterday’s stunt in the Washington Post, in which it was implied that American weapon systems had been compromised, is not likely to change anything. If it is not China, more leaking, or tactical planting of information, is taken to the big media. Earlier, the Wall Street Journal reported that Iran has been into corporate American energy infrastructure. Iranian-backed hackers have escalated a campaign of cyberassaults against U.S. corporations by launching infiltration and surveillance missions against the computer networks running energy companies, according to current and former U.S. officials. In the latest operations, the Iranian hackers were able to gain access to control-system software that could allow them to manipulate oil or gas pipelines. They proceeded “far enough to worry people,” one former official said. The developments show that while Chinese hackers pose widespread intellectual-property-theft and espionage concerns, the Iranian assaults have emerged as far more worrisome because of their apparent hostile intent and potential for damage or sabotage. The US touched off a hot covert war with Iran when it deployed the destructive Stuxnet malware and perhaps other viruses into that country’s networks in an attempt to derail or slow down its nuclear program. Many computer security experts not in the US government warned that this would touch off an cyber-arms race and escalations. In light of this the country continues to act as if it the exceptional nation. It balefully speaks of the actions of others against US networks while reserving the prerogative to conduct extra-legal operations against those deemed enemies. We can no longer have it both ways. There are costs as well as consequences and they quickly become obvious. In theory, manipulating the software could be used to delete important data or turn off key safety features such as the automatic lubrication of a generator, experts said. Current and former U.S. officials wouldn’t name the energy companies involved in the attacks. or say how many there were. But among the targets were oil and gas companies along the Canadian border, where many firms have operations, two former officials said. The officials also wouldn’t detail the precise nature of the evidence of Iranian involvement. But the U.S. has “technical evidence” directly linking the hacking of energy companies to Iran, one former U.S. official said. The same people are gathered to comment. The reliance on jargon is a bit cute. Kinetic sounds more erudite than blowing them up. The Iranians are very threatening because they are bent on destruction, of setting an example of their power in cyberspace, reads the piece. There is the continuing implication that a country with a military that compares to the US as an ant compares to a hob-nailed boot has the potential to create a serious and horrid event in the continental US simply by pushing software switches from remote. The Chinese, on the other hand, have “a 50-year plan” and are interested in maintenance of stability. So they are only quietly stealing things. The media selects and carefully grooms its stories, including those which involve cybersecurity and cyberwar. It actively excludes and edits those who do not exude the right tone. This has always been so. The Washington Post’s story on a DoD report and the confidential side of it which revealed China had allegedly compromised important US weapons platforms was guaranteed to generate copycat news pieces throughout the day and the rest of the week. It was learned that this brand of posh wine was a favorite of Richard Clarke’s when he mentioned it repeatedly in Breakpoint, his techno-thriller novel which included cyberattacks on the country. James Lewis — from the archives. The select choice for the National Rifle Association loons of WhiteManistan, as mentioned earlier on DD tv, bullet proof school wear for your children. With his new line, MC Kids, Caballero offers backpacks and jackets for kids, including some in girlie pink and stamped with fluttering fairies, that are also outfitted with bulletproof plating to stop the slugs from an Uzi. Caballero, 46, said that in his 20 years of business, there had never been a demand in Colombia for bulletproof children’s clothing. But the United States is a different market: a country where there are about as many firearms as people, Caballero pointed out, and where mass shootings have simply prompted some to stock up on weapons and seek other forms of protection. The article ads the company is trying to sell its tactical vests into classrooms. “[It’s a] complete indictment for our gun policy that we’d put bulletproof clothing on our children instead of stopping the bullets in the first place,” someone sane tells the newspaper. If you’ve been following along it’s no secret the US government and the national security industry have been waging an increasingly concerted campaign to increase cyber-defense spending. The lynchpin of the strategy is the relentless argument that Chinese hackers, under the guidance of its government and military, are into all American corporate business, military networks and the nation’s infrastructure. Because of this catastrophe looms. Another ploy in this orchestrated theatrical production arrived today in the guise of the Defense Science Board report, Resilient Military Systems and the Advanced Cyber Threat. However, it is not the same report the Washington Post’s Ellen Nakashima publicized in a big story on alleged deep Chinese cyberespionage directed against the US military and its arms manufacturers. “Designs for many of the nation’s most sensitive advanced weapons systems have been compromised by Chinese hackers, according to a report prepared for the Pentagon and to officials from government and the defense industry,” writes Nakashima for the Post. The Post’s report never makes clear if classified information was taken. And it informs that internal US government discussion of some of the incidents with China is now over a year old. What does seem to be secret, but in a selective way, is the Defense Science Report. The Post reporter delivers the information on Chinese cyber-espionage by admitting she has access to a “confidential” section of the report not included in the copy made generally available to the public. The public version of the DSB report contains only three instances of the word “China” and only one of “Chinese.” “Espionage” appears only four times in report’s 146 .pdf pages. It means one of the Defense Science Board’s members or minions — which can be any number of a pool of representatives from arms manufacturers like Boeing and Northrop Grumman, to consultants to these same businesses or small national security “think tanks” or lawyers in legal firms providing consultation on cybersecurity issues under contract to the Department of Defense — leaked the real report, the “confidential” part, to the Washington Post. These are never selfless acts to get word out about an emerging national threat. That’s not how things work. What it is is another report, among an increasing number, aimed at growing the national security industry’s cyberwar and cyber-defense programs, in which many of the Defense Science Board’s members are employed. The secret report, the one the Washington Post tells us about, is to redirect attention toward a new threat. It is part of a national argument that generally lumps all cyber-crime , cyber-spying and claimed cyberwar into one big threat aimed at the United States, over everyone else. Nakashima’s report for the Post grudging includes the information that spokesmen for the Chinese government have complained that it is the victim of hacking and cyberespionage, too. Indeed, a recent set of articles in the Financial Times on the subject includes an analysis that recounts internal cyberespionage in China, a case in which groups of young hackers invade Chinese firms, as well as those in other countries, in collection of information and e-mails which can be sold to competing firms or used in extortion schemes. China’s corporate security businesses are not as mature as American competitors, the FT informs. As a result, criminal hacking groups and espionage efforts can be very successful. Obviously, the Chinese read the Washington Post and they are not naive. They know how the system works in America, too. And they are unlikely to be cowed or embarrassed by a newspaper story about a “confidential” Pentagon report, news of which is a fairly obvious case of insider manipulation. Of course, everyone connected with the DSB report knows this, too. Thought question: What’s the difference between a good leak and a bad leak? Answer: Bad leaks are those the Department of Justice is commanded to investigate. Good leaks are when contractor/consultants give “confidential” material on an expanding national security threat to the WaPost. Yes, China is engaged in cyber-espionage against us. The US military is the largest and most powerful in world history. It would be a surprise if everyone wasn’t trying spy on it and its vast private sector infrastructure of giant arms and services contractors. How do you secure such a large globe-spanning enterprise, one in which there will always be thousands of people, or even many more, who dumbly click on e-mail attachments, idly insert foreign media, go off secure protocols or copy sensitive materials to networked home or unsecured devices for convenience? Rhetorical question. What can be seen in the non-secret version of Resilient Military Systems and the Advanced Cyber Threat? Well, there is a loud call for mounting a big defensive and offensive military cyberwar capability, claiming that the cybersecurity threat facing the nation is equivalent to, or even more serious and complex than, things like mounting strategy against the German U-boat campaign in WW2 and the achievement of nuclear deterrence during the Cold War (page 38). Readers may recall the latter was the building of a survivable capability to blow up the entire world in the case of a doomsday attack. Cyberthreats are given a taxonomy and a graphic illustration. They range from nuisances, Tier 1 threats, to Tier 6 threats, malware hardware/software as yet unmade that is an “existential” threat. It then proceeds to explain what constitutes various tier threats. The Stuxnet virus, which the report coyly declines to mention was developed and deployed by the United States, was a Tier 4 threat. The Agent.btz worm/malware, a piece that circulated worldwide in 2008, is given the same rating. Which I and others would call inflated but which left a lasting scar on the US military because it demonstrated that DoD was no better at keeping viruses off its networks than anyone else. Agent.btz is never actually named in the Advanced Cyber Threat report. Instead the authors reference only the problem contained by “Buckshot Yankee,” which means nothing to laymen because it is not explained in the edition released to the public audience. Buckshot Yankee was the name given to the operation aimed at neutralizing Agent.btz. As an illustrative example of what constitutes a past Tier 6 threat, the DSP report comes up with the spying IBM Selectric typerwriter, machines that were altered by the Soviet to collect and transmit what was typed on them. The spying typewriters were put into US embassies in Moscow and Leningrad. A newer Tier 6 threat is what I call the Subversive Chip of Cyber Doom. The subversive chip would work normally in US computing and weapons systems until triggered by conditions or an outside signal. At which point it could transmit compromised information or destroy the processor and operating system. Other parts of the document discuss growing the US capacity for offensive cyberwar and establishing a “resilient” cyber force, a potentially immense open-ended project that is said to be of the utmost urgency. More germane excerpts on China and cyberespionage from recent Financial Times pieces. More than a quarter of US companies surveyed by the American Chamber of Commerce in China say they have had trade secrets stolen or compromised through cyber attacks on their China operations, adding weight to US accusations that Beijing is behind numerous corporate espionage attacks. In response to a question about the Amcham survey, a spokesman for the Chinese Foreign Ministry described any accusation of Chinese cyber theft as “irresponsible” and urged US officials and companies “not to politicise economic and trade issues and to stop hyping the issue of cyber security”. Link. Mr Du, “deputy chief engineer of the National Computer Network Emergency Response Team of China,” blamed [a mistaken identification of an IP in China as origination of a recent cyberattack on South Korean banks] on governments’ growing wariness since the detection in 2010 of Stuxnet, a worm which is believed to have been launched by the US and Israel against Iran’s nuclear programme. If you’re a 3-D printing nerd, what’s not to like here? In the Culture of Lickspittle, the odious rise to the top. In this manner, 3-D print manufacturing, at least for the short term, is saddled with the image that it’s a bunch of libertarian white nerds and insurrectionists obsessed with making plastic weapons. To stick it to the man! Some are apparently bummed by this. To prevent 3D printers from getting a bad rap, Michigan Tech wants to highlight the positive impact 3D printing can have on technology with a new contest. Other suggestions include low-cost medical devices, tools to help people out of poverty, designs that could help reduce racial conflict, something that could reduce wars over oil by channeling renewable energy sources, tools to reduce military conflict or objects that could improve sustainable economic development. Tools to help people out of poverty, designs that could help reduce racial conflict. Just like smartphone and apps do, right? Good luck with that, nerds. We suspect the reach exceeds the grasp. Do what you know works. Make 3-D knives. 3-D shotgun slugs. 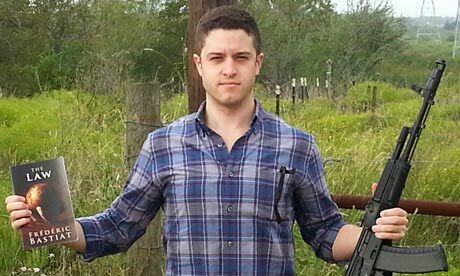 The Cody Wilson Revolution — from the archives. More 3-D Kool-Aid: Ending world hunger, the $200,000 chocolate or pizza maker.